Author: Bryson, Bill Set In . . .
After living in Britain for two decades, Bill Bryson recently moved back to the United States with his English wife and four children (he had read somewhere that nearly 3 million Americans believed they had been abducted by aliens—as he later put it, "it was clear my people needed me"). They were greeted by a new and improved America that boasts microwave pancakes, twenty-four-hour dental-floss hotlines, and the staunch conviction that ice is not a luxury item. 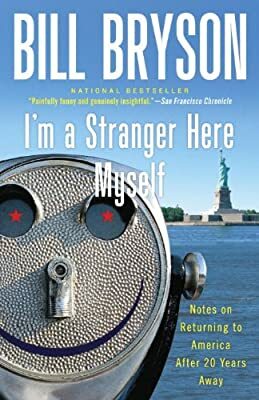 Delivering the brilliant comic musings that are a Bryson hallmark, I'm a Stranger Here Myself recounts his sometimes disconcerting reunion with the land of his birth. The result is a book filled with hysterical scenes of one man's attempt to reacquaint himself with his own country, but it is also an extended if at times bemused love letter to the homeland he has returned to after twenty years away.